His name is engraved on the Malta War Memorial, a 49ft column commemorating the 2,298 Commonwealth aircrew who lost their lives around the Mediterranean. But for more than 70 years, John Henry Coates had no grave. The 24-year-old Warrant Officer with RAF 111 Squadron was listed only as missing in action. Yesterday, under the Italian sunshine, he was given the burial that had long been denied him. The town turned out to watch and pay their respects as, with full military honours, his coffin was carried into the little church at Cavarzere on the outskirts of Venice, and then to the military cemetery at Padua, 25m away. Shelagh Coates brushed away a tear as an RAF bugler played the Last Post. John Coates was her uncle. She had grown up knowing his name but not what had happened to him. Her father – John’s younger brother, Frank – had seldom discussed it. He died four years ago. It was the discovery in 2017 by archeologists of the wreckage of his Spitfire on the banks of the Adige river near Cavarzere that made possible the funeral. Alongside the Merlin engine, wings, fuselage and cockpit, they found John’s remains. 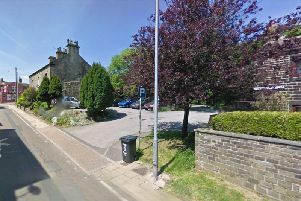 Mrs Coates, who came forward after an appeal in The Yorkshire Post to find his surviving relatives, said: “There was a march through the town with bands playing. The police took part, and there were local schoolchildren. It was all surreal. “So many people came out to watch. So many people came, say thank you. They understood that without people like John Henry Coates, they would not be here. He had died on March 5, 1945, just two months before VE Day, when six Spitfires took off from Rimini airfield to bomb two dozen barges moored on a canal close to Cavarzere. Amid intense but inaccurate anti-aircraft fire, they dropped their payload of a dozen 250lb bombs south of the canal. But W/O Coates was caught by flak. His aircraft hit the ground and exploded. “There are no words that can express that excitement of being able to give a proper burial to a soldier so that he can finally rest in peace, “ said Alessandro Voltolina, a researcher in Italy, whose team presented with Mrs Coates with piece of the wreckage. “John Henry was a 24 year-old boy who died alone in a lost field, miles away from his home and family,” he said. Back home in Stamford, Lincolnshire, where the family relocated after the war, Mrs Coates had known only that her uncle was one of the flyers who did not return. “All we knew really was that he was very intelligent man. He won a scholarship to Cambridge, but he didn’t go because his father couldn’t afford to send him. So he had joined the RAF as a reserve. Padua War Cemetery, where 488 other service personnel are buried, was a fitting final resting place, she said.